The Twin Fawn trail is located in Ridgway State Park about 6 miles north of the town of Ridgway, Colorado. 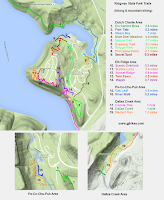 The trail begins at the Elk Ridge Campground where it makes a relatively steep descent to the Dutch Charlie Marina area. Besides providing access to the marina and swim beach for those staying in the campground the Twin Fawn trail is a nice scenic trail to hike. The upper end of the Twin Fawn trail begins across from Loop E of the Elk Ridge Campground. There isn't really any place to park at this end of the trail. Most people that use the trail either begin from their campsite or get here from one of the other trails in the area. There is parking on the marina end of the trail where a short hike along the Secret Place trail leads to the lower end of the Twin Fawn trail. From the trailhead the route leads across the top of the ridge for a short distance before beginning its descent. From up here it looks a long way down to the marina but it is only about 300 feet lower in elevation. The steeper portions of the trail have steps to ease the descent and help control erosion. Hikers that have been on some of the other trails in the park will find the Twin Fawn trail to be a little rougher than most. How much luckier can you get than to actually see a doe passing through with a pair of fawns following along behind her. The trees are pretty thick on the north side of Elk Ridge. There are only one or two spots where you can see the reservoir at all. It gives the trail a feeling of seclusion. Near the bottom of the ridge the reservoir finally does appear as the trail comes out into the open. This picture is of the channel that connects the main body of the reservoir to Mears Bay. There is good fishing all along the shores through here. We have never been skunked at Ridgway Reservoir in the 30 or 40 years that we have been fishing here. There is also fishing access from here on the opposite side of the bay from the Enchanted Mesa and Mears Bay trails. The Twin Fawn trail comes to an end at its junction with the Secret Place trail. There is a nice picnic area in the grove of trees straight across the Secret Place trail from this junction. From here the trail to the left leads down to the cove while to the right it leads to the marina and swim beach. 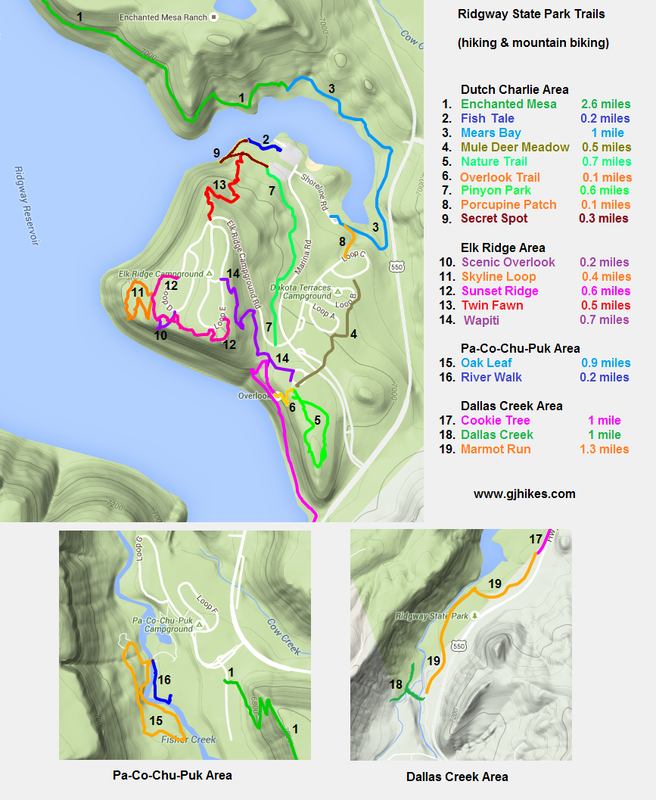 If you plan on hiking or biking very many of the other trails in Ridgway State Park you might want to print out a map and take along. They also have a free trail map that you can ask for in the Visitor Center. We tend to get here before the Visitor Center is open and leave after it is closed so it pays for us to bring our own map. Currently the maps at the entrance station only include a few of the trails. As far as the Twin Fawn trail goes, if you would like to see it for yourself then all you have to do is 'Take a hike'.